Bruno A. Boley, Dean Emeritus of Engineering at Northwestern University and Professor of Civil Engineering and Engineering Mechanics at Columbia University, passed away peacefully on February 11, 2017 in Providence, RI. He was a life Member-at-Large of IUTAM, as well as former Treasurer (1992-1996) and Secretary of the Congress Committee (1976-1984). Bruno was born in Gorizia, Italy in 1924 under the surname “Bolaffio”, which was changed to “Boley” shortly after his family immigrated to America on April 20, 1939. In January 1940, he enrolled at City College of New York, where, in 1943, he received a B.S. degree in Civil Engineering. Under the supervision of Nicholas J. Hoff (1906-1997), Bruno served as Director of the Aerostructures Laboratory at the Polytechnic Institute of Brooklyn, where he was awarded his Sc.D. in Aeronautical Engineering in1946. He remained there as an assistant professor until 1948, after which he was employed for two years as an engineering specialist with the Goodyear Aircraft Company in Akron, Ohio. He returned to academia in 1950 as an Associate Professor of Aeronautical Engineering at Ohio State University (OHSU), and it was there that he developed his interest in the field of thermal stresses. 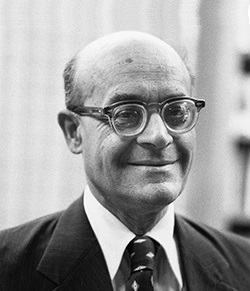 In 1952, he left OHSU for an associate professorship in Civil Engineering at Columbia University, and became a member of the aerostructures group under its director, the eminent Hans Bleich (1909-1985). Bruno spent his most productive research years at Columbia, where he made seminal contributions to the fields of thermoelasticity, structural dynamics, elastic stability, heat conduction in solids, and applied mathematics. He was then appointed as the J. P. Ripley Professor of Engineering and Chair of the Department of Theoretical and Applied Mechanics at Cornell University – a position he retained until 1972. While at Cornell, he started Mechanics Research Communications, for which he served as editor-in-chief until 2005. He was chosen as Dean of Northwestern University’s Technological Institute in 1972, a position that he held until 1986, and thereafter as dean emeritus and the Walter P. Murphy Professor of Engineering. Under Bruno’s leadership, the Technological Institute saw significant growth in its faculty, programs, and students. He returned to Columbia University in 1988 as a part-time professor in the Department of Civil Engineering and Engineer Mechanics, where he finished his long and productive career. As an internationally recognized scholar, Bruno garnered many honors and awards for his numerous contributions to the field of mechanics over his long career, during which he published more than 100 articles and five books. He was elected to the National Academy of Engineering in 1975, received the Townsend Harris Medal in 1981 from the Alumni Associate of the College of the City of New York as well as an honorary Sc.D. in 1982 from the same institution. He was awarded the Worcester Reed Warner Medal from the ASME and the ASCE von Karman Medal both in 1991, and the 2001 ASME Daniel C. Drucker Medal. In 1996, Bruno was invited to give the Lagrange Lecture at the prestigious Academia dei Lincei in Rome, Italy. He was an honorary member of the American Society of Mechanical Engineers, a Fellow of the American Academy of Mechanics, the American Institute of Aeronautics and Astronomics, the Society of Engineering Science and the American Association for the Advancement of Science. He served on the Board of Governors of both the ASME and Argonne National Labs, was the founder of the Association of Chairmen of Departments of Mechanics, served as the Advisor-General for the International Association of Structural Mechanics in Reactor Technology, and was a member of the editorial boards of twelve technical and professional journals. Beyond his technical contributions, and enormous influence on the field of mechanics, Bruno Boley was a true humanitarian who was deeply concerned for the well-being and success of his students and colleagues. He was an extremely kind and insightful individual who extended himself to help others in their careers. He knew how to laugh and enjoy life; indeed, his great wit and keen perception made being in his presence a truly wonderful experience. While Bruno will be especially remembered by those of us whose lives he touched so keenly, he will also be remembered by the untold numbers who did not have the good fortune of meeting him, but whose work was advanced ever so much further by his contributions. The special issue in honor of Bruno Boley that was published in Mechanics Research Communications for his 90th birthday is available here .